All aboard?” said the captain. I have the misfortune to be a very nervous man. A sedentary literary life has helped to increase the morbid love of solitude which, even in my boyhood, was one of my distinguishing characteristics. As I stood upon the quarter-deck of the Transatlantic steamer, I bitterly cursed the necessity which drove me back to the land of my forefathers. 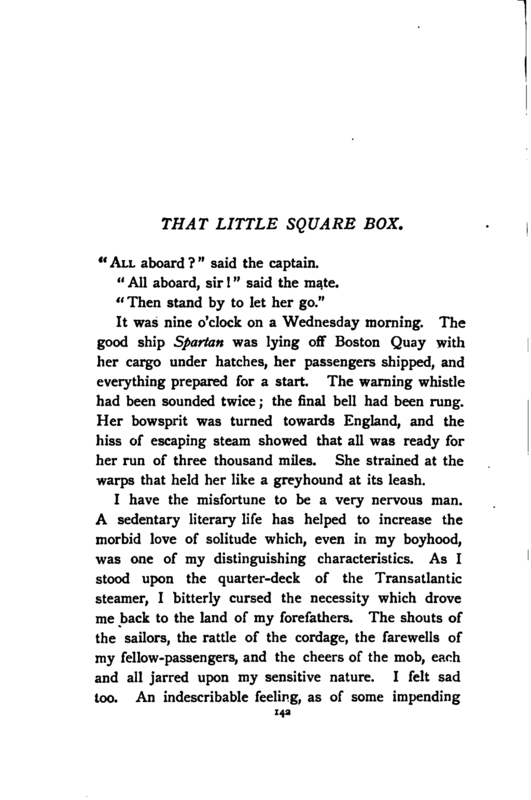 The shouts of the sailors, the rattle of the cordage, the farewells of my fellow-passengers, and the cheers of the mob, each and all jarred upon my sensitive nature. I felt sad too. An indescribable feeling, as of some impendingcalamity, seemed to haunt me. The sea was calm, and the breeze light. There was nothing to disturb the equanimity of the most confirmed of landsmen, yet I felt as if I stood upon the verge of a great though indefinable danger. I have noticed that such presentiments occur often in men of my peculiar temperament, and that they are not uncommonly fulfilled. There is a theory that it arises from a species of second-sight, a subtle spiritual communication with the future. I well remember that Herr Raumer, the eminent spiritualist, remarked on one occasion that I was the most sensitive subject as regards supernatural phenomena that he had ever encountered in the whole of his wide experience. Be that as it may, I certainly felt far from happy as I threaded my way among the weeping, cheering groups which dotted the white decks of the good ship Spartan. Had I known the experience which awaited me in the course of the next twelve hours I should even then at the last moment have sprung upon the shore, and made my escape from the accursed vessel. “Time’s up!” said the captain, closing his chronometer with a snap, and replacing it in his pocket. “Time’s up!” said the mate. There was a last wail from the whistle, a rush of friends and relatives upon the land. One warp was loosened, the gangway was being pushed away, when there was a shout from the bridge, and two men appeared, running rapidly down the quay. They were waving their hands and making frantic gestures, apparently with the intention of stopping the ship. “Look sharp!” shouted the crowd. “Hold hard!” cried the captain. “Ease her! stop her! Up with the gangway!” and the two men sprang aboard just as the second warp parted, and a convulsive throb of the engine shot us clear of the shore. There was a cheer from the deck, another from the quay, a mighty fluttering of handkerchiefs, and the great vessel ploughed its way out of the harbour, and steamed grandly away across the placid bay. We were fairly started upon our fortnight’s voyage. There was a general dive among the passengers in quest of berths and luggage, while a popping of corks in the saloon proved that more than one bereaved traveller was adopting artificial means for drowning the pangs of separation. I glanced round the deck and took a running inventory of my compagnons de voyage. They presented the usual types met with upon these occasions. There was no striking face among them. I speak as a connoisseur, for faces are a specialty of mine. I pounce upon a characteristic feature as a botanist does on a flower, and bear it away with me to analyse at my leisure, and classify and label it in my little anthropological museum. There was nothing worthy of me here. Twenty types of young America going to “Yurrup,” a few respectable middle-aged couples as an antidote, a sprinkling of clergymen and professional men, young ladies, bagmen, British exclusives, and all the olla podrida of an ocean-going steamer. I turned away from them and gazed back at the receding shores of America, and, as a cloud of remembrances rose before me, my heart warmed towards the land ofmy adoption. A pile of portmanteaus and luggage chanced to be lying on one side of the deck, awaiting their turn to be taken below. With my usual love for solitude I walked behind these, and sitting on a coil of rope between them and the vessel’s side, I indulged in a melancholy reverie. From the first moment of their conversation a horrible misgiving had come over me. It seemed more than confirmed as I gazed at what lay before me. It was a little square box made of some dark wood, and ribbed with brass. I suppose it was about the size of a cubic foot. It reminded me of a pistol-case, only it was decidedly higher. There was an appendage to it, however, on which my eyes were riveted, and which suggested the pistol itself rather than its receptacle. This was a trigger-like arrangement upon the lid, to which a coil of string was attached. Beside this trigger there was a small square aperture through thewood. The tall man, Flannigan, as his companion called him, applied his eye to this, and peered in for several minutes with an expression of intense anxiety upon his face. The shorter man fumbled in his pocket for some time, and then produced a small paper packet. He opened this, and took out of it half a handful of whitish granules, which he poured down through the hole. A curious clicking noise followed from the inside of the box, and both the men smiled in a satisfied way. His bluff manner and ruddy healthy face seemed to be a positive insult to me in my present condition. Had I been a courageous or a muscular man I could have struck him. As it was, I treated the honest sailor to a melodramatic scowl which seemed to cause him no small astonishment, and strode past him to theother side of the deck. Solitude was what I wanted — solitude in which I could brood over the frightful crime which was being hatched before my very eyes. One of the quarter-boats was hanging rather low down upon the davits. An idea struck me, and climbing on the bulwarks, I stepped into the empty boat and lay down in the bottom of it. Stretched on my back, with nothing but the blue sky above me, and an occasional view of the mizen as the vessel rolled, I was at least alone with my sickness and my thoughts.